On October 27, 1968, Austrian-Swedish physicist Lise Meitner passed away. She is known today for her passionate and extraordinary work on radioactivity and nuclear physics along with her colleague Otto Hahn, who was honored with the Nobel Prize while Meitner stayed unrecognized. Lise Meitner was born on November 7, 1878 in Vienna Leopoldstadt (2nd district of Vienna), Austria. She was the third daughter of the Jewish lawyer Philipp Meitner and his wife Hedwig Meitner-Skovran. Lise Meitner’s talents were early detected, not unusual for scientists who achieved these major efforts in their later lives. It was just bad luck that she unfortunately was not male. She was not allowed to attend either grammar school or university and could only later finish these studies. After finishing school, Lise Meitner passed the French teacher’s examination. In addition, she prepared herself for the Matura (high school exam) in self-study and passed in 1901 at the age of 22 at the Akademisches Gymnasium Wien, where she stated that her chosen profession was the “realistic study of philosophy”. In 1901 Lise Meitner began to study physics, mathematics and philosophy at the University of Vienna, where she was highly influenced but also respected by Ludwig Boltzmann, a genius in physics himself. It was later noted that Boltzmann “gave her the vision of physics as a battle for ultimate truth, a vision she never lost“. Already in the first years she dealt with questions of radioactivity. She was the second woman to receive a doctorate in physics from the University of Vienna in 1906. The title of her doctoral thesis was “Prüfung einer Formel Maxwells” (published as Wärmeleitung in inhomogenogenen Körpern), and her supervisor was Franz-Serafin Exner. She then applied to Marie Curie in Paris, but without success. The first year after her doctorate she worked at the Institute for Theoretical Physics in Vienna. In 1907 she went to Berlin for further scientific training to attend lectures by Max Planck. There she met the young chemist Otto Hahn for the first time, with whom she was to work for the next 30 years. 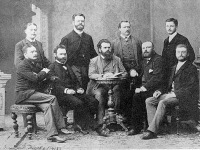 She worked with Hahn – as he did – as an “unpaid guest” in Planck’s workroom, a former “wood workshop”, at the Chemical Institute of the Friedrich-Wilhelms-University. Since women were not allowed to study in Prussia at that time, she had to enter the building always through the back entrance and was not allowed to enter the lecture rooms and experiment rooms of the students. Despite these difficulties, their collaboration was commented by James Chadwick as “one of the most fruitful partnerships in the history of science“. 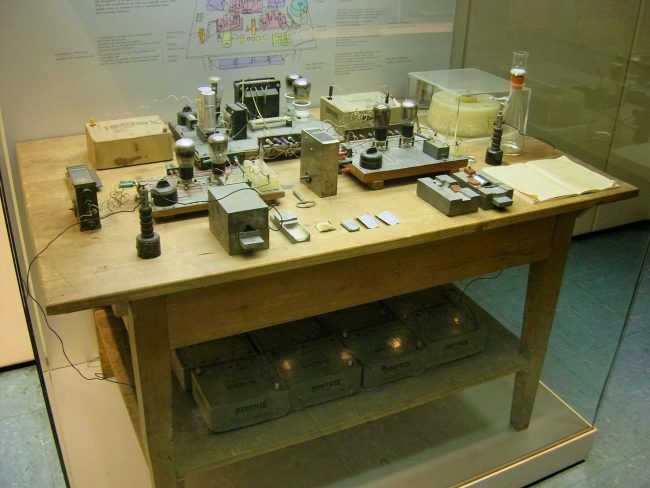 Otto Hahn discovered the radioactive recoil in 1909 and with the subsequent “recoil method” Hahn and Lise Meitner also found various radioactive nuclides in the following years. Through these successes, Lise Meitner made a name for herself in physics. From 1912 to 1915 she was unofficial assistant to Max Planck. After serving in World War I, Meitner came back to work with Otto Hahn. In 1918, Lise Meitner received her first own radiophysical department with an appropriate salary and became head of the physical-radioactive department of the Kaiser Wilhelm Institute for Chemistry. In 1922 she habilitated and thus got the right to work as a lecturer. In 1926 she became an associate professor of experimental nuclear physics at Berlin University, Germany’s first professor of physics. Things changed in 1933, due to Adolf Hitler who was gaining power and worsening the situation for thousands of researchers including the work group of Lise Meitner. At the beginning of 1933 Meitner, like many others, was still confident that the consequences of the NSDAP assumption of power would remain mild. But as a consequence of the law for the restoration of the professional civil service from the beginning of April 1933, Meitner was deprived of her right to teach due to her Jewish ancestry; she could only continue her work on radiation experiments with neutrons at the (non-state) Kaiser Wilhelm Institute. In 1938, when Germany annexed Austria, Lise Meitner became a German citizen and was thus particularly endangered as a native Jew. Otto Hahn was very concerned about her safety and therefore, together with the Dutch chemist Dirk Coster, prepared her illegal departure for exile, which succeeded on 13 July 1938. She came to Sweden via the Netherlands and Denmark, where she continued her research at the Nobel Institute until 1946. Hahn and Meitner continued to correspond with each other. 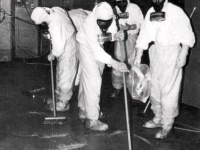 At the end of December 1938, Hahn and his assistant Fritz Straßmann wrote to Hahn about a process which he had discovered through extremely careful radiochemical methods and which he described as the “bursting” of the uranium nucleus. Because it was impossible for Meitner and Hahn to publish their works on nuclear fission together for political reasons, Hahn was the one associated with their major efforts. Otto Hahn continued to keep Lise Meitner informed about all the experiments carried out in Berlin (he had not informed the physicists in his institute and Lise Meitner had been the only one to inform about all the experiments and results by letter). In February 1939, Lise Meitner and her nephew, the nuclear physicist Otto Robert Frisch, were able to publish a first physical-theoretical interpretation in the essay “Disintegration of Uranium by Neutrons: a New Type of Nuclear Reaction“, a first physical-theoretical interpretation of the “bursting” of the uranium atomic nucleus formulated by Otto Hahn. 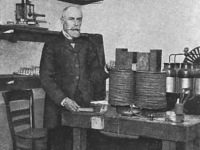 Frisch coined the term “nuclear fission”, which subsequently became internationally recognized. The two fragments (atomic nuclei) formed during fission together have a lower mass than the original uranium atomic nucleus. From this mass difference Lise Meitner and Otto Robert Frisch calculated with Einstein’s formula E=mc² the energy of about 200 million electron volts per atomic nucleus released during fission. The resonance on this publication was extraordinary. By December 1939 more than 100 publications had been published dealing with the problem of nuclear fission. However, nuclear fission had consequences far beyond the realm of science because each fission process releases not only the two fragments but also some neutrons, which trigger further fission processes in other uranium nuclei. This chain reaction makes it possible to make technical use of the extremely high fission energy. It only took three years to realize this idea. 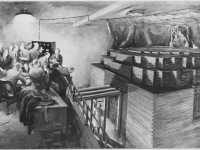 The first functioning nuclear reactor, built by Enrico Fermi at the University of Chicago, became “critical” in December 1942, i.e. the chain reaction ran independently and the reactor produced energy. In July 1945, however, the first atomic bomb was detonated in the desert of Alamogordo, New Mexico; the Janus head of the nuclear fission thus came to light. In 1945 Otto Hahn was awarded the Nobel Prize in Chemistry for 1944 for the discovery and radiochemical detection of nuclear fission (it was not awarded until 1946). Lise Meitner and Otto Frisch were not considered, and even in the following years they were not awarded this honour, although several physicists – including Otto Hahn himself – nominated them for the Nobel Prize in Physics. The non-award to Lise Meitner and Otto Frisch is not comprehensible from today’s point of view, above all because the two wrote the theoretical explanation for the phenomenon in Stockholm. 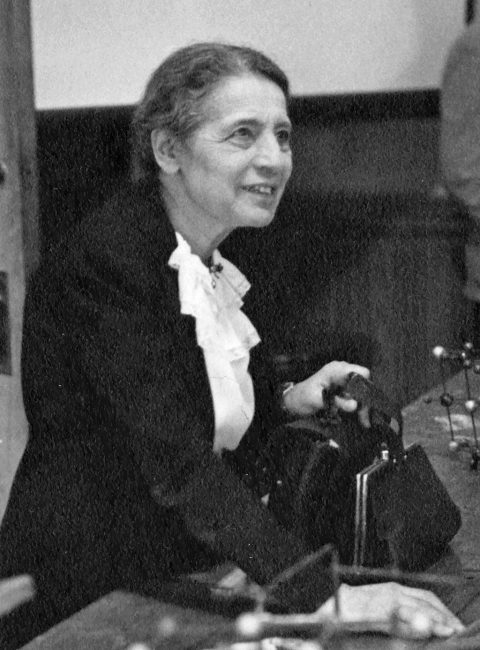 From 1947, Lise Meitner headed the nuclear physics department of the Physics Institute of the Royal Institute of Technology in Stockholm and held various visiting professorships at US universities. In the post-war period Lise Meitner received numerous honours all over the world, especially in the Federal Republic of Germany, for example the first “Otto Hahn Prize for Chemistry and Physics” in 1955. In 1959, the “Hahn-Meitner-Institut für Kernforschung” (HMI) was officially inaugurated in Berlin by the then Governing Mayor Willy Brandt – in the presence of both namesakes. Lise Meitner always came to Germany for all these occasions, but also for private visits. In 1960 Lise Meitner moved to her nephew Otto Robert Frisch in Cambridge, where she was to spend the last eight years of her life. Until her death at the age of 89, she advocated the peaceful use of nuclear fission. Lise Meitner died on 27 October 1968, a few months after Otto Hahn. Lise Meitner is to be seen as a genius physicist who despite the political and social challenges she had to face never gave up on her dream to becoming a giant in her fields of research. She is along with Otto Hahn responsible for presumably one of the most effective but also dangerous discoveries of humankind. However, Lise Meitner was mostly (after finally leaving the stereotypes behind) appreciated in the scientific community. Even Albert Einstein praised her as the ‘German Marie Curie‘ and in 1997 the synthetic element 109 (Meitnerium) was named after her. At yovisto academic video search you can enjoy the lecture ‘Lise Meitner and the Discovery of Fission‘ by Anthea Coster from Dartmouth College.